Brill Jessup would rather work than deal with the bitterness she feels about her husband Kurt’s infidelity. They’ve made a fresh start with Brill taking a job as the new police chief in a small East Tennessee town. Kurt is genuinely contrite and making every effort to show his commitment to Brill. Meanwhile Emily, their nine-year-old, is being the perfect little girl, as if she can make everything okay again. So why can’t Brill get over this anger? Work presents the perfect distraction as rumors and superstition are running rampant in the wake of the disappearances of seven people in seven days. As fear rises in the community, Brill works desperately to solve the mystery… until it threatens her family and she is forced to confront the real enemy. 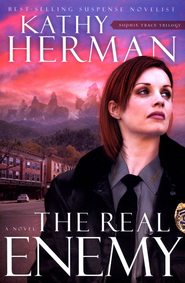 Suspense novelist Kathy Herman is widely-recognized in the Christian book industry, having worked five years on staff at the Christian Booksellers Association (CBA) in Colorado Springs, eleven years at Better Books Christian Center in Tyler, Texas as product buyer/manager for the children’s department, and eventually as director of human resources. 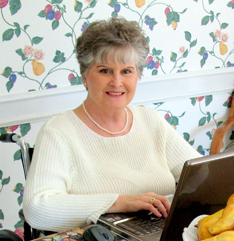 She also conducted numerous educational seminars on children’s books at CBA Conventions in the U.S. and Canada, served a preliminary judge for the Evangelical Christian Publishers Gold Medallion Book Awards (now known as ECPA Christian Book Awards), and worked as an independent product/marketing consultant to the CBA market. Since her first novel, Tested by Fire, debuted in 2001 as a CBA national bestseller, she’s added nineteen more titles to her credit, including eight additional bestsellers: All Things Hidden, The Real Enemy, The Last Word, The Right Call, False Pretenses, Dangerous Mercy, Relentless Pursuit, and Not by Sight. Kathy’s husband Paul is her manager and most ardent supporter, and the former manager of the LifeWay Christian Store in Tyler, Texas. They have three grown children, five almost-perfect grandchildren, and a rescue cat named Samantha. The couple also shares a mutual interest in identifying birds and butterflies, a hobby that goes hand-in-hand with Kathy’s passion for photography. Kathy Herman has been a long time favorite of mine. She combines great characters with real life struggles and page-turning mysteries to produce great novels. She always includes a faith message that speaks to readers as well. The Real Enemy is the first book in her Sophie Trace Trilogy. I enjoyed it and am looking forward to more with the Jessup family in the quaint town set in the Smoky Mountains of Tennessee. Brill Jessup is the new police chief of Sophie Trace. Her family is attempting a new start, but past regrets, betrayals and bitterness keep them from truly moving on. Brill’s husband, Kurt, was unfaithful and it is this that has impacted the whole family. Unwilling to forgive, Brill immerses herself in her work, which following mysterious abductions and increased gang activity, has gotten harder and more complicated. Herman does a good job of balancing the family drama with a good mystery. Both story lines kept this reader interested. Herman explores the damage that is done to the whole family when just one strays from God’s law. The mystery of the missing people makes way for the town legend of the Red Shadows adding an interesting look into the history of the early settlers and Native Americans of the Smokies. I also liked that Herman introduces supporting characters that add color to the small community. Nick’s restaurant is the hub for town gossip and serves as a means for the main characters and the reader to gauge the pulse of the town. I listened to The Real Enemy on my morning walks. The reading was well done — a great pace that made my exercise fly by. So if you are looking for a mystery with some depth and spiritual truth in the mix, check out The Real Enemy.